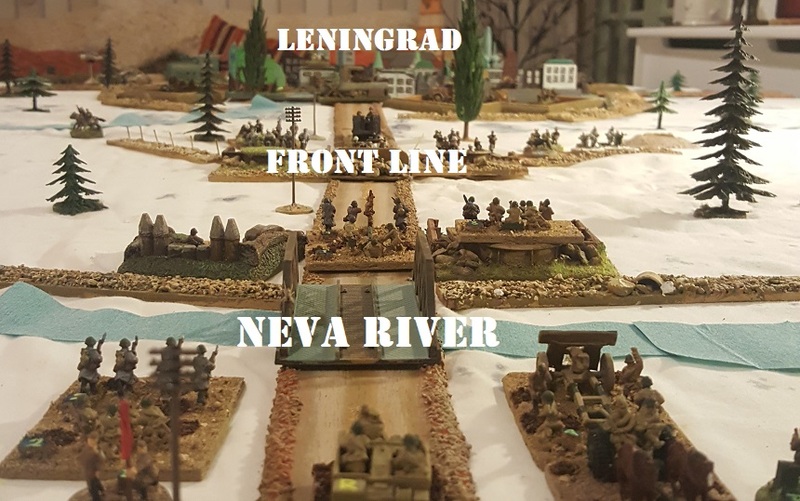 This is the first part on a big WWII Operational Game being fought out over a number of evenings mostly between myself and NQM’s Chris … I’ve titled it the retaking of Leningrad because that is what we must do. 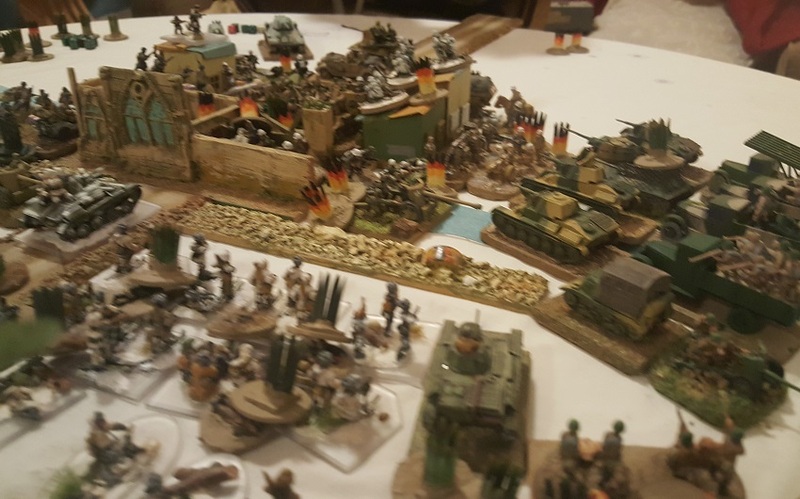 It’s a long way to the Front but these wastes will fill with men and materiel as the operation evolves. There is a lot of kit being directed at this task. 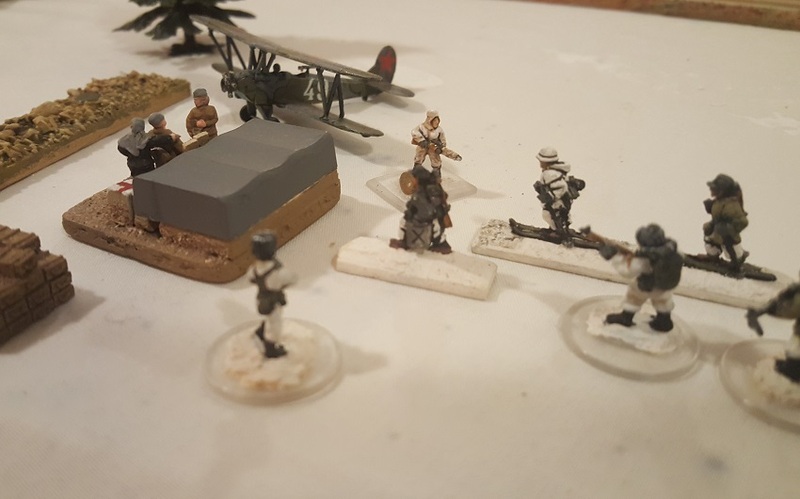 Thanks to Will we were back on WWII and back on PBI but this time with his 20mm figures. 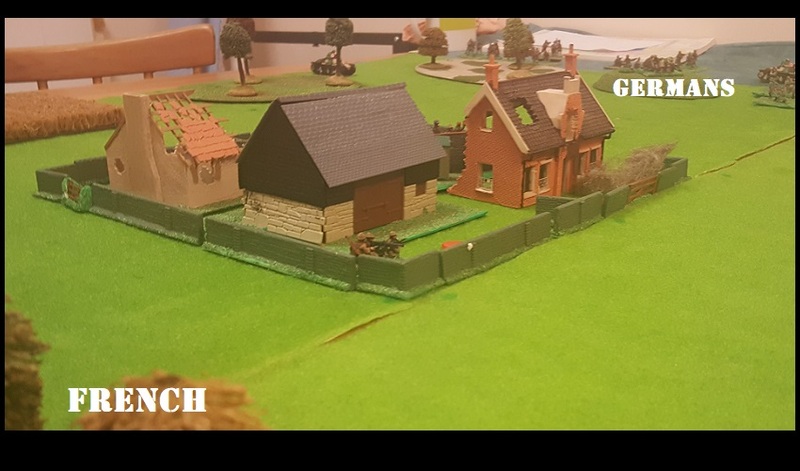 Quite an old school look, then, to this brave attempt by the French to hang on to a farmstead in the face of escalating German advances. 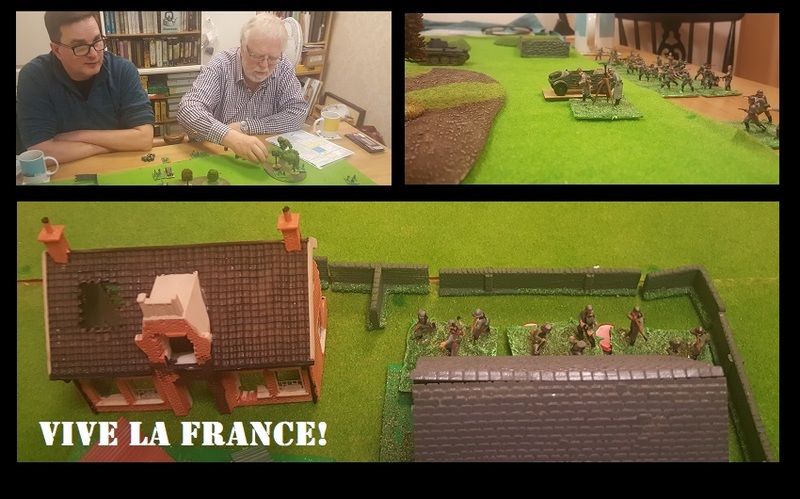 Will and Patrick took the Germans, ‘NQM Chris’ and I the French. 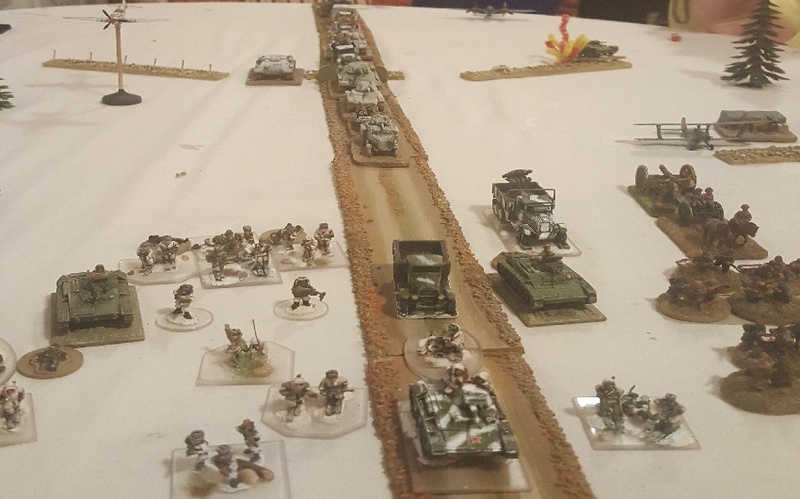 The Germans had a lot more automatic firepower than we did and slightly better tank support. 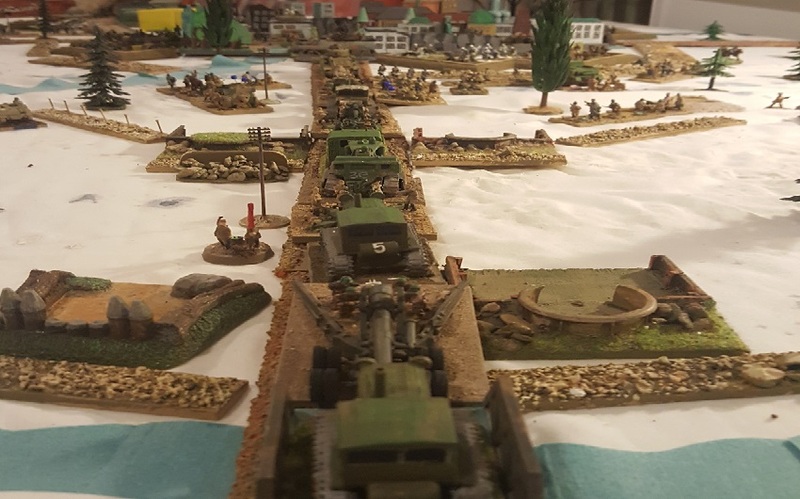 I doubted our 25mm Hotchkiss would stop them and expected to be overrun quite quickly. 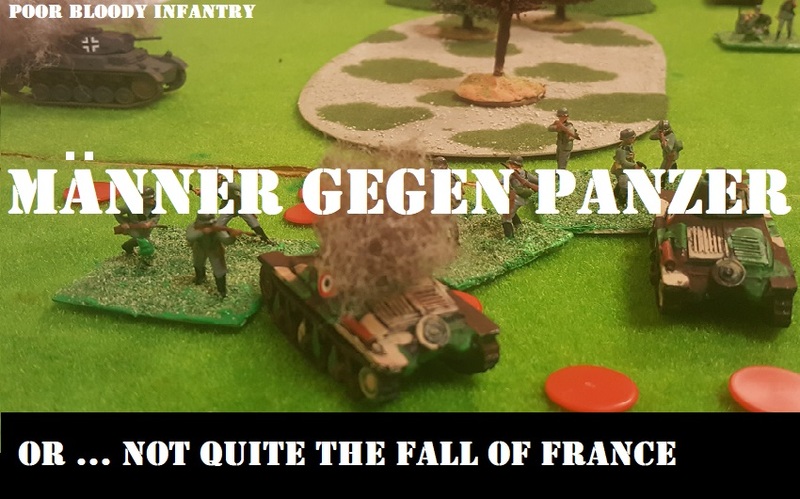 The Germans hastily responded but in doing so presented a perfect taget to the little French pop gun. 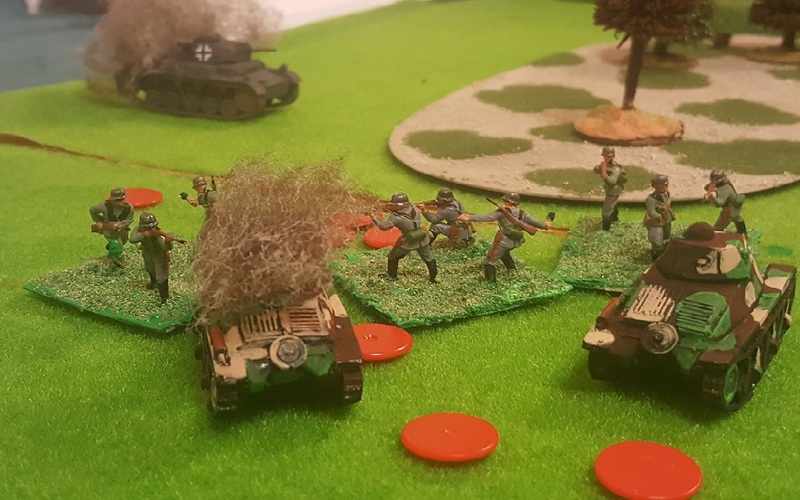 The remaining German troops on that flank (coutesy of maximum roll for action points) mounted an immediate grenade assault on the mixed French force. 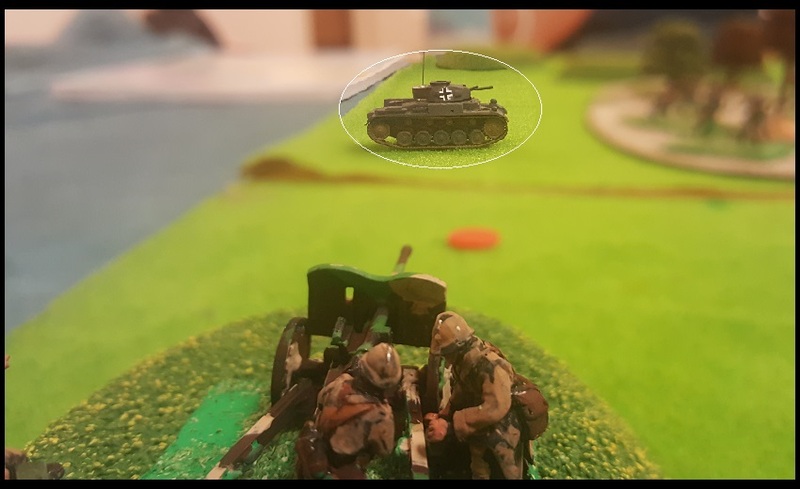 They managed to strip away the infantry with preparatory shooting then trusted to their Manner gegen Panzer training. It was messy. It was heroic but ultimately failed. 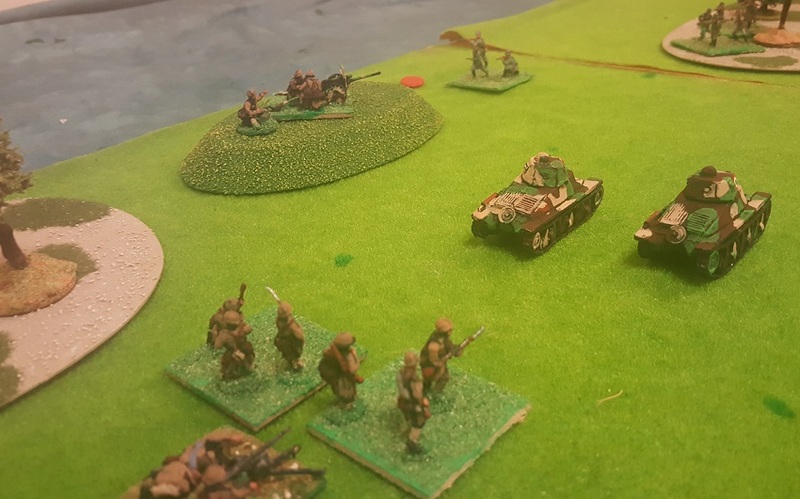 As a game mechanism, they did get to roll more dice, but the vehicles get to roll to save (the foot do not): 2 hits a-piece, but the tanks saved one so the infantry are repulsed losing 2 stands. 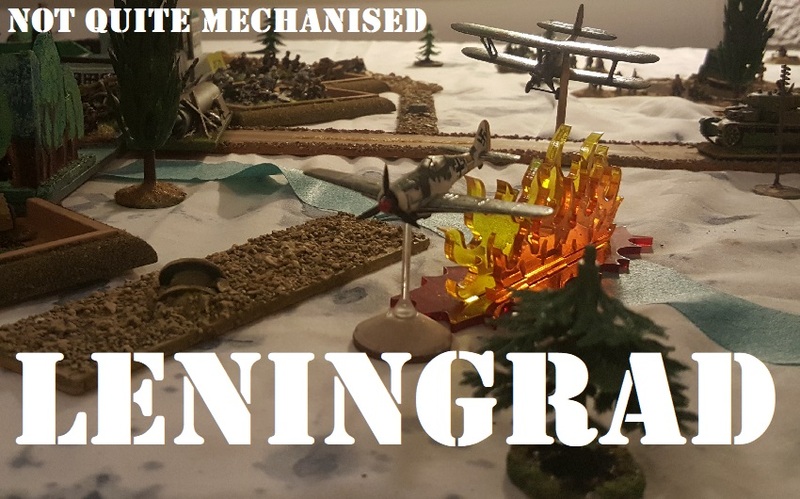 The surviving stand was lost in the disengagement roll. 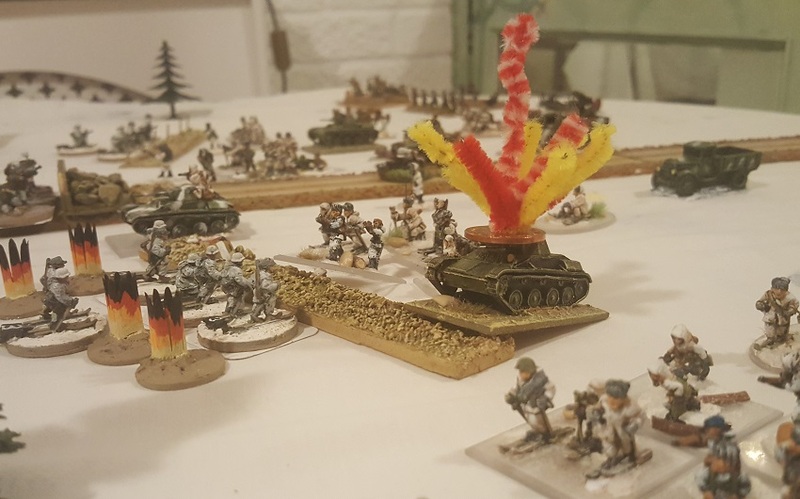 This, combined with a failed morale test on the other flank (after a mortar stonk) meant the German plan to wrap around the position had not worked. 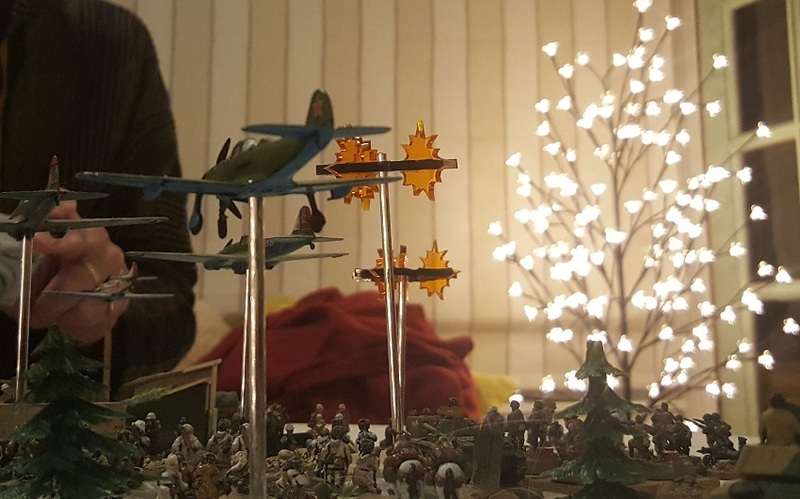 They still had the means to mount a frontal attack. 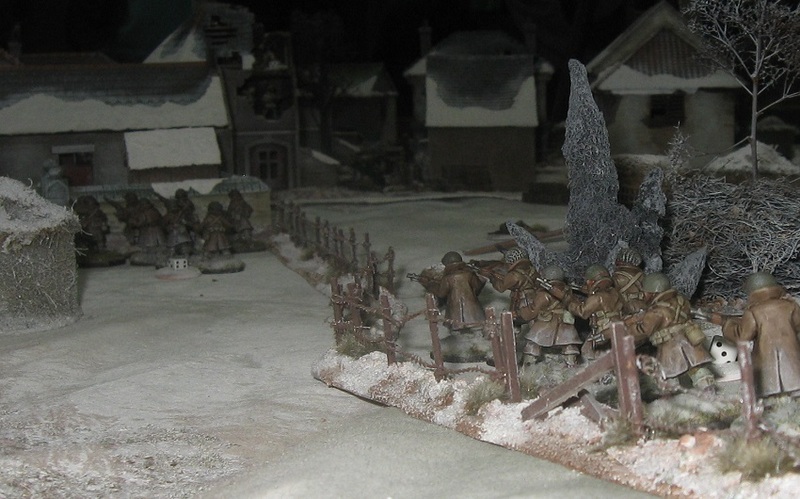 But fresh French troops were now reinforcing the near empty position and the game clock was running down. 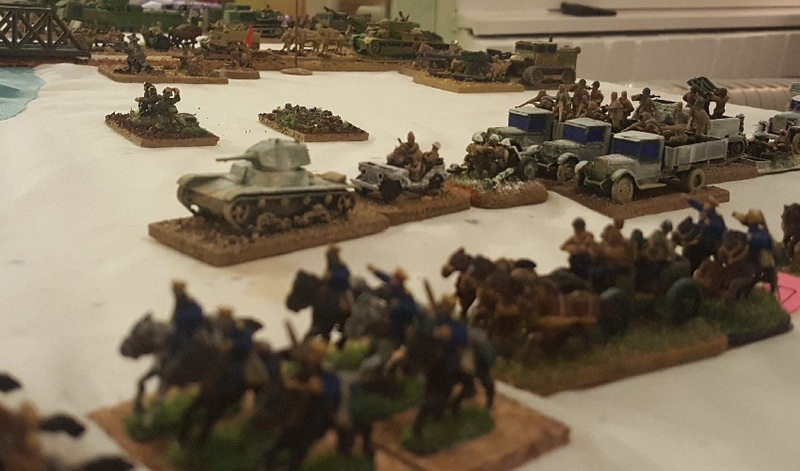 Against expectations, this hastily organised French position would hold on just a little longer. 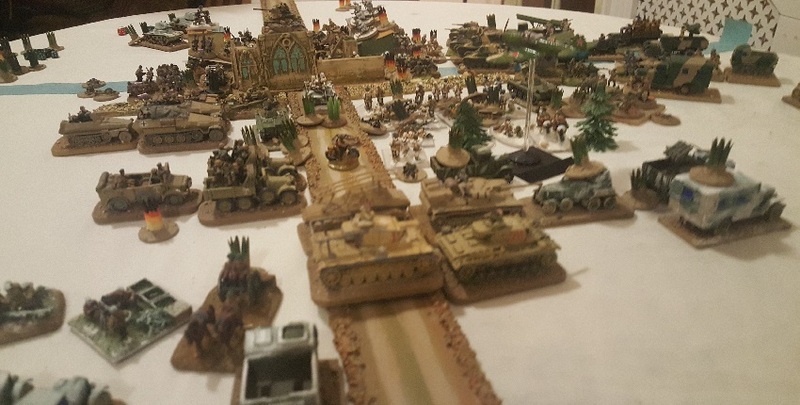 … and into battle ..
… and now an armoured column appears on the road West .. 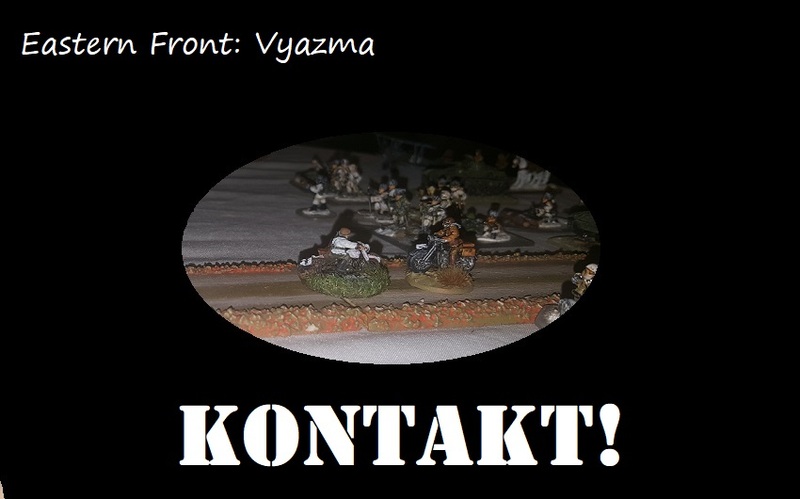 Although the centre of Vyazma holds til the last man, armour quickly bursts through defences to the South .. 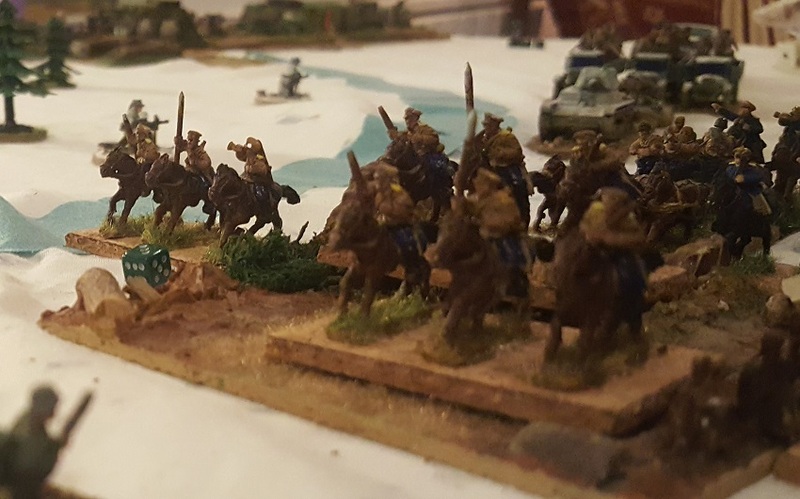 The Battle for Vyazma is fully committed when a German column crshes into the flank of the offensive. 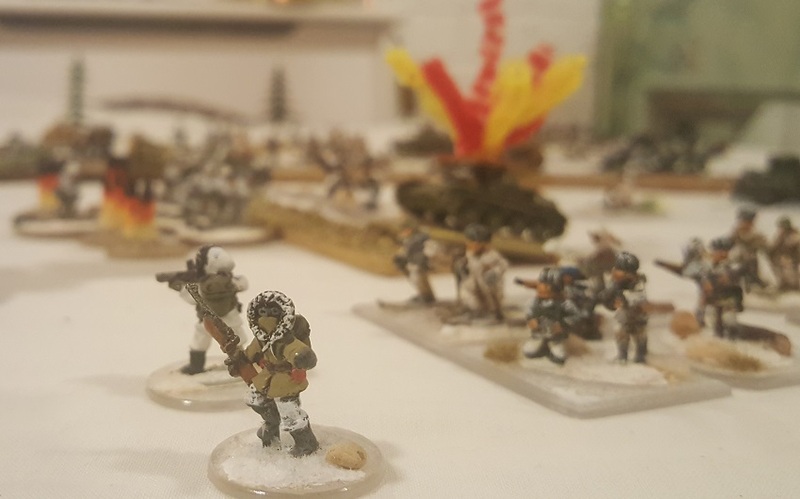 For them the war is over. Kudos to Chris for managing such a mass of material in such a compact space. It all made sense at the time. 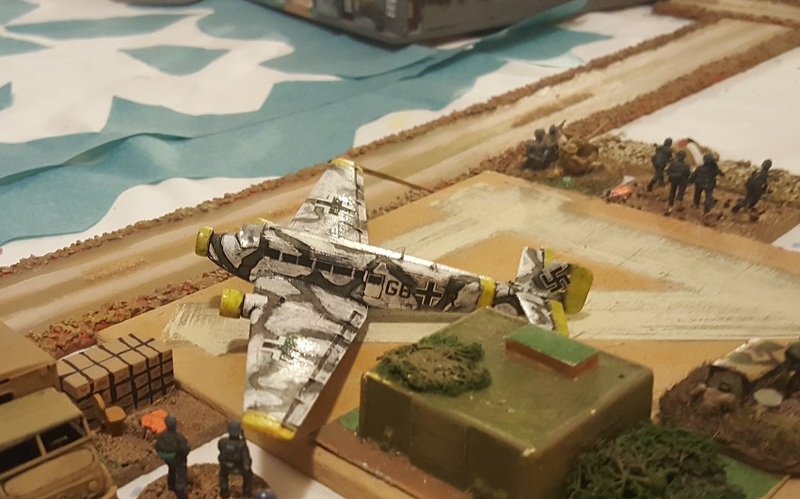 *objective 1: get them painted; objective 2: get them into a game! ** as I suggest, for the narrative details, see Chris’s post. So here’s the result of the experiment, ready for Chris’s next NQM retreat from Moscow. 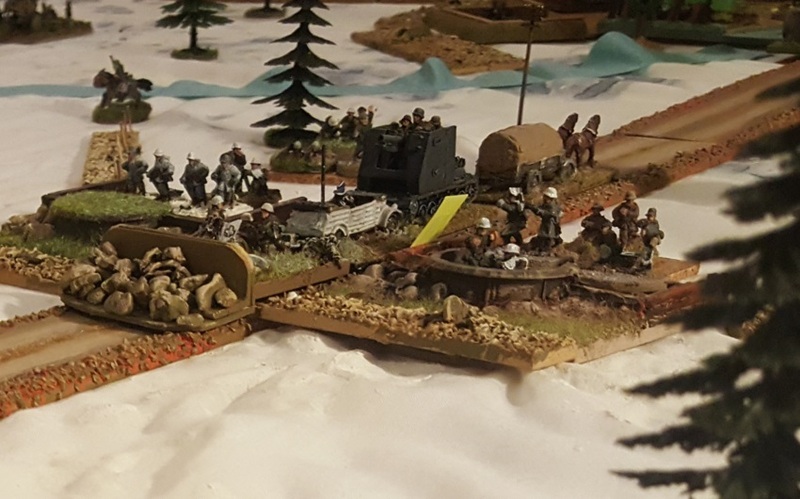 I think it works quite well and expands upon my ski troops. Hopefully, in time, Martin will make some new packs in the more familiar voluminous coverall. I would buy some. 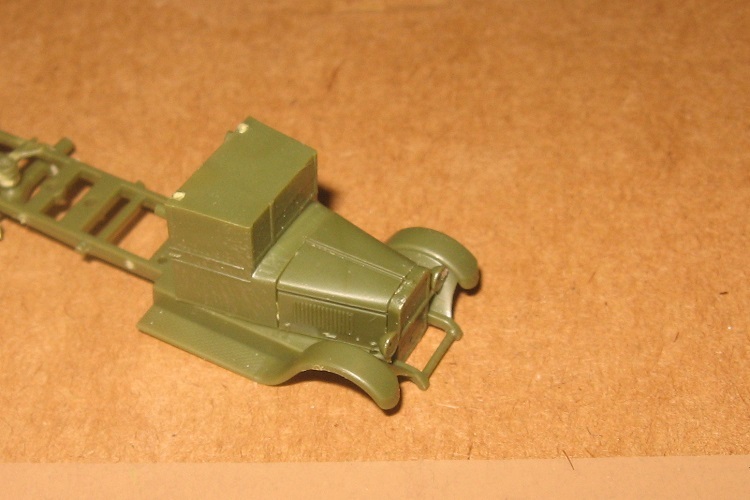 The truck in the background is one of the new Piggie resin models. Looks good I think. I’m happy with that experiment. The force expands. More lovely 1:1200 naval … I recently came across Revell’s reissued Littorio Class model (boxed as Roma) and could not resist. 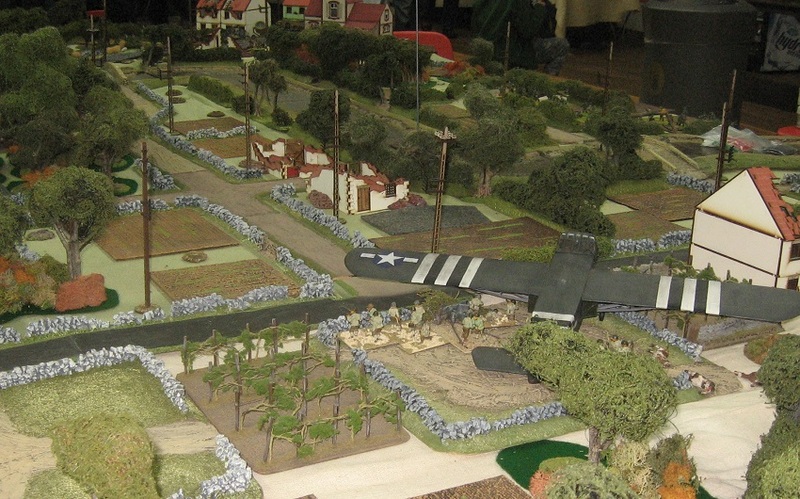 Splendid and simple little model. 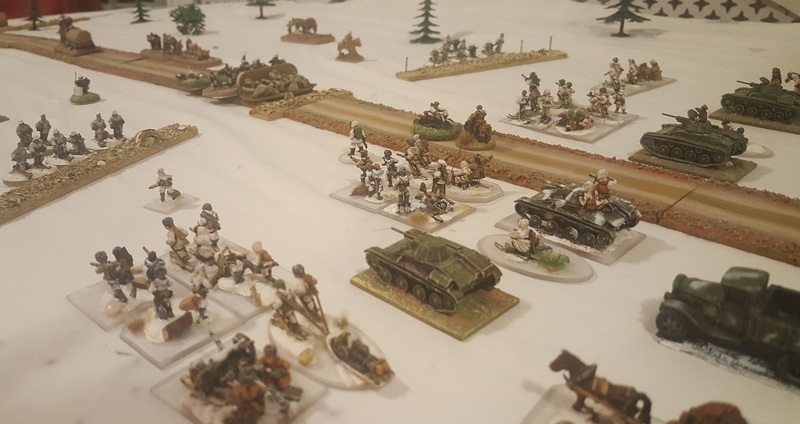 This game mirrored some real events that took place in the Winter War … but for our purposes, the mission takes place in North Africa, just after the Vichy French forces joined the Allied cause. 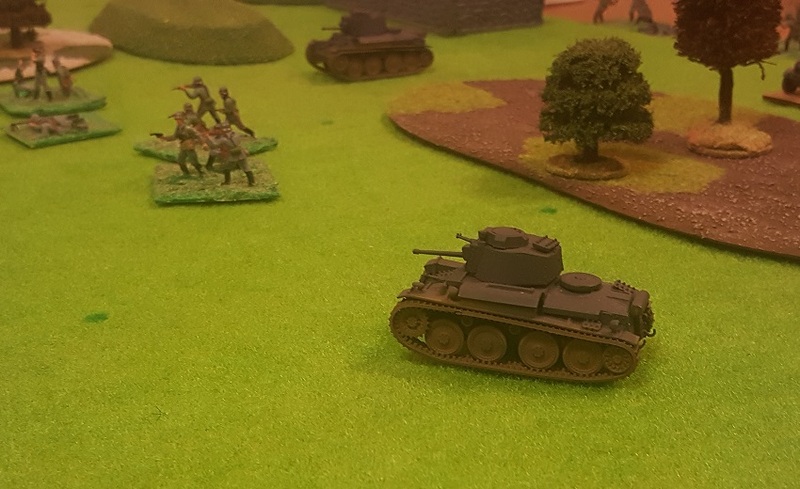 Some isolated German paratroops have taken possession of a broken down Tiger tank. 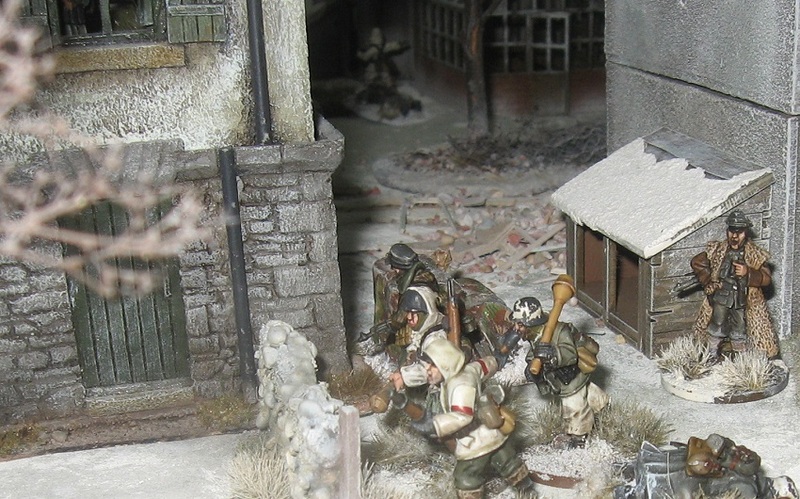 A French armoured car patrol has run into them and called up support. 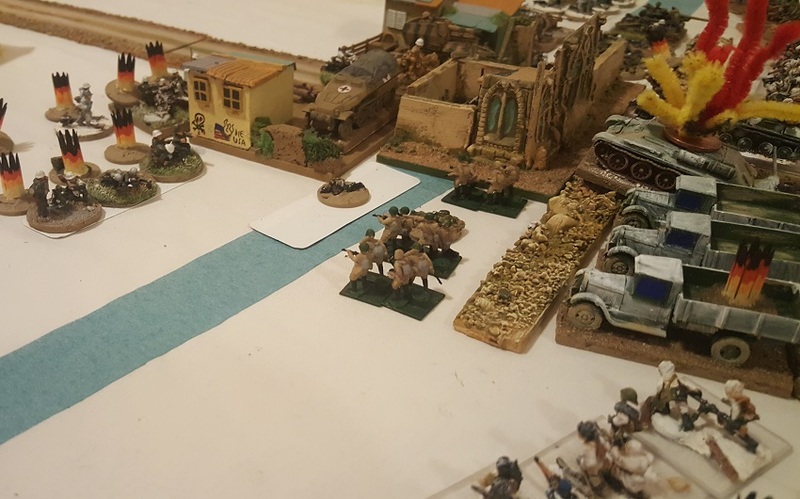 The game is PBI and support for the Germans will come in the form of 2 ‘platoons’ of Saharianas … for the French, infantry is arriving and there will be an airstrike. 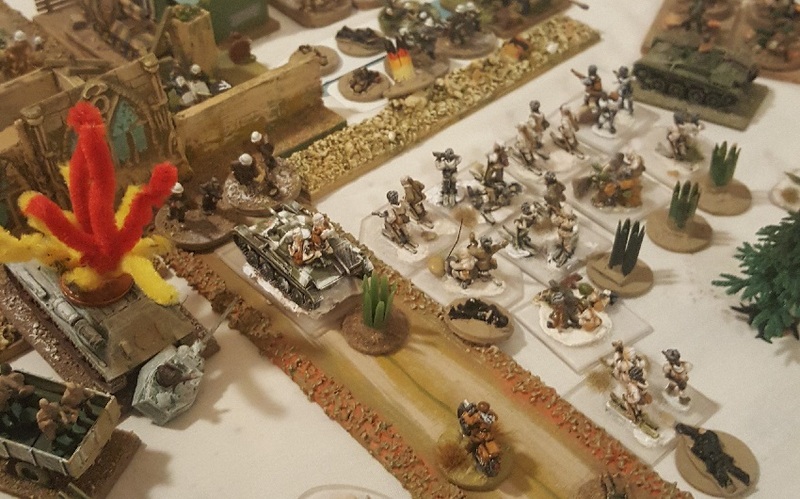 As you can see on the picture, the French player has been allowed to place a small platoon in ambush. 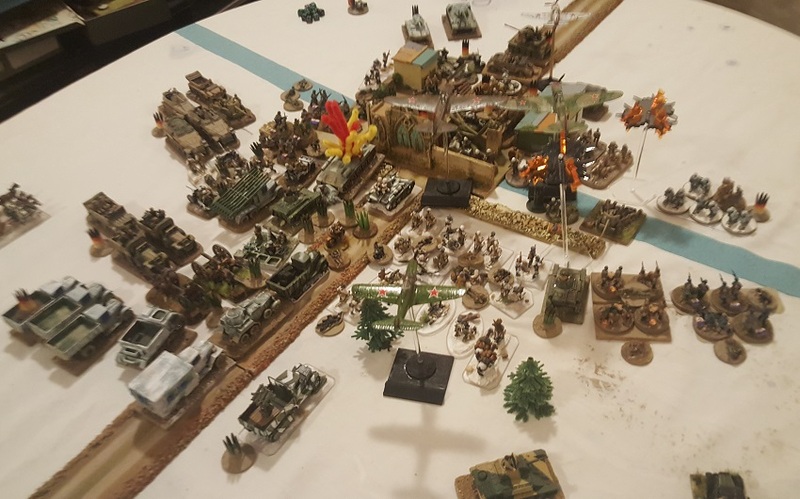 The main objective is the broken down Tiger in the middle of the table. It is not manned and has no function other than as a marker. … and the field kitchen and its essential victualing resources. Because you just have to have one. 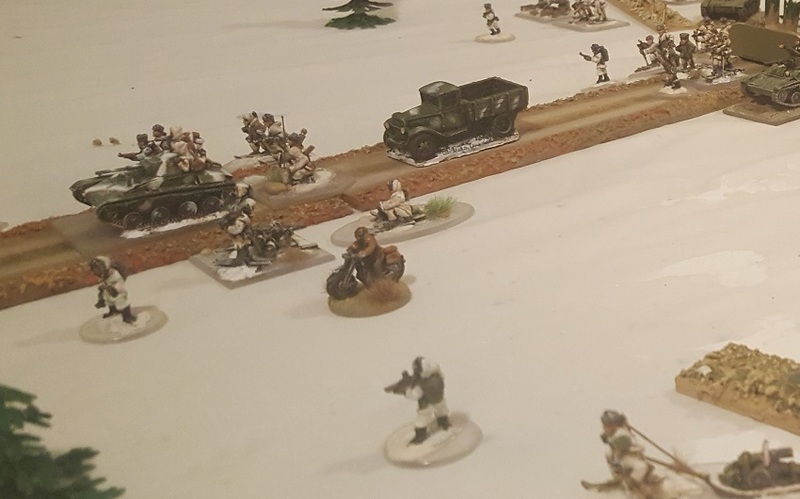 The German AA truck was actually taken out by an anti-tank rifle from some of the Legionaires approaching from the East. 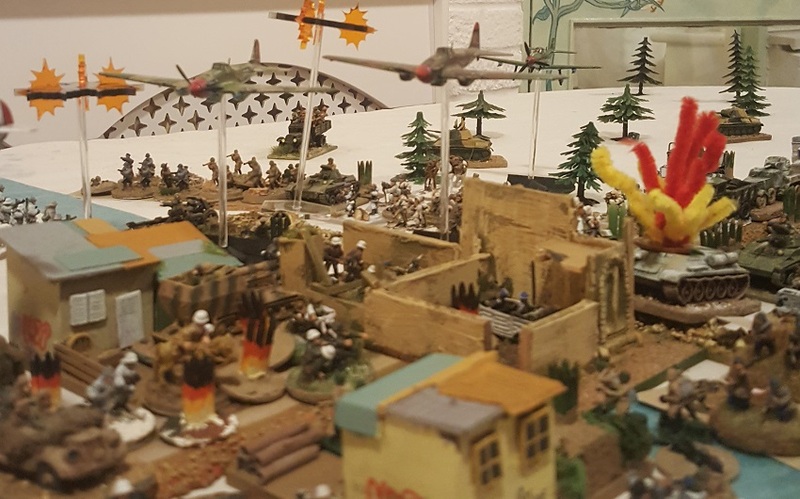 But there was also a MG42 crew on the roof. 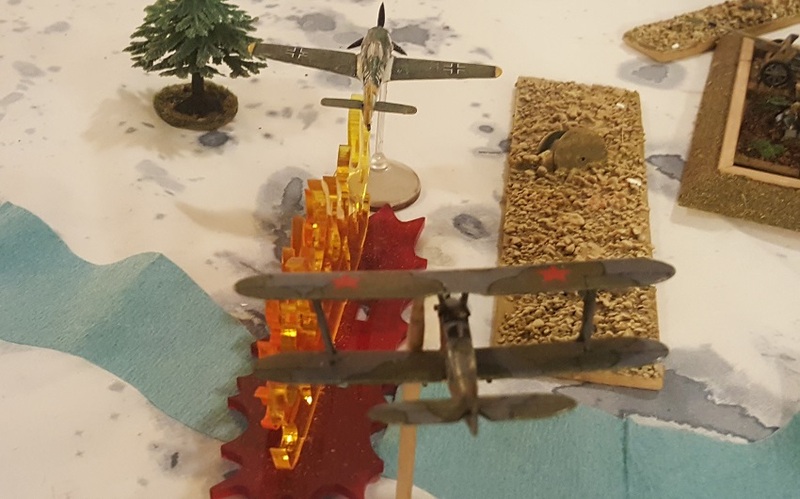 … which effectivel pinned the Laffly’s down … and ultimately took them out. 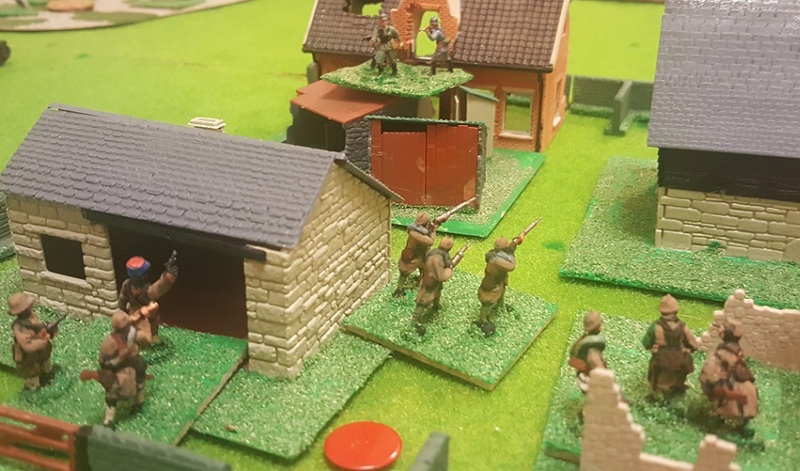 Meanwhile, the Arabs burst out in the buildings and close assaulted the Paras. If only you could plan these things. 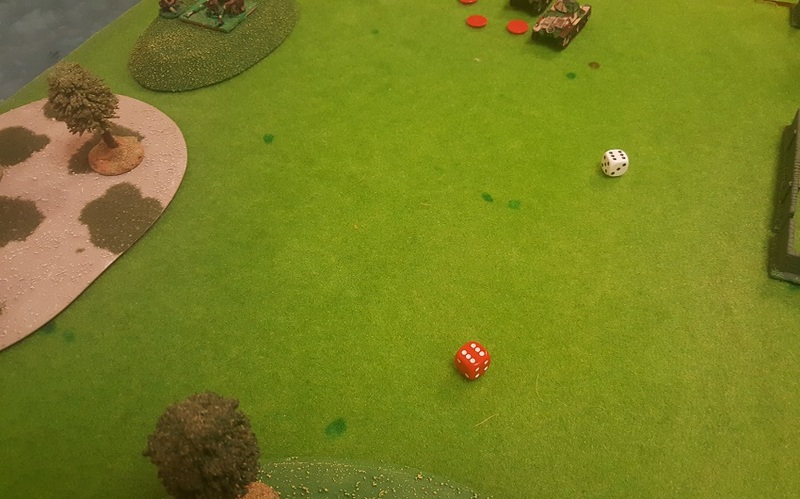 Equally frustrating, the Hawk fighter missed its target (the required die roll allowing the defender to define the ‘off target’ drift). 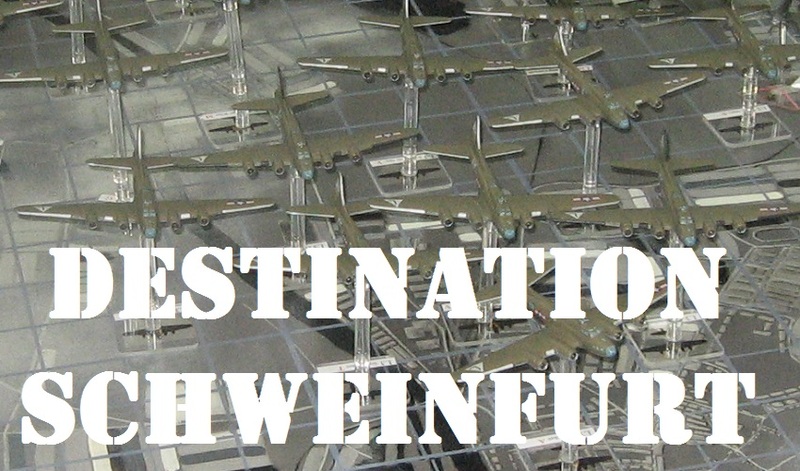 We diced for these in traditional PBI style (which caused some predictable consternation as not everyone likes the mechanism) … I usually build arrivals into the scenario, but for this gathering I wanted to retain some flavour of the basic game. 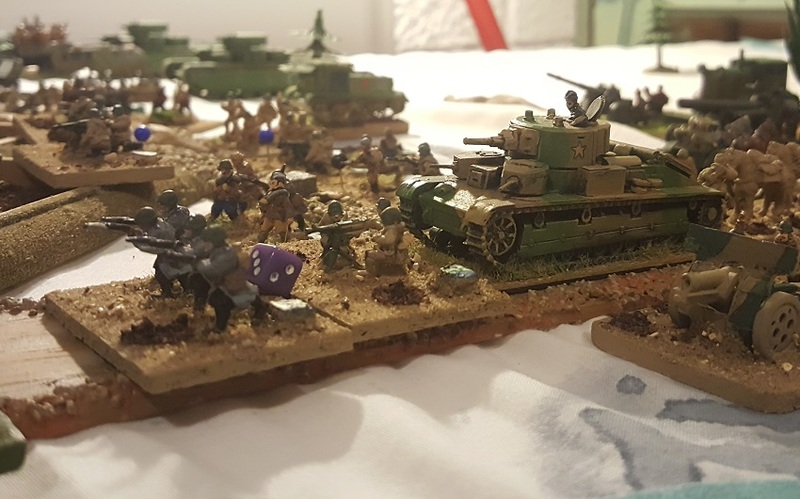 … and my newly painted Semovente – bought at Campaign, painted during the week – and straight onto the wargame table. It had to be done. 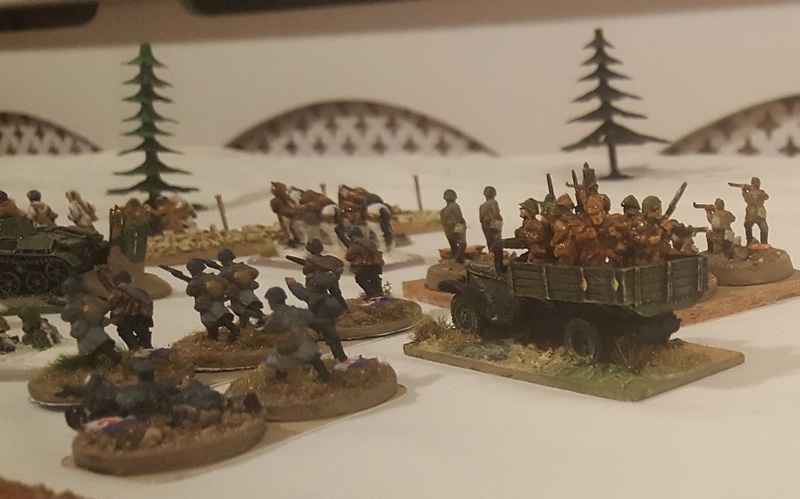 Amongst the French arrivals were these truck mounted Hotchkiss AA guns … quite vulnerable but about the best support weapons available to the French commander. 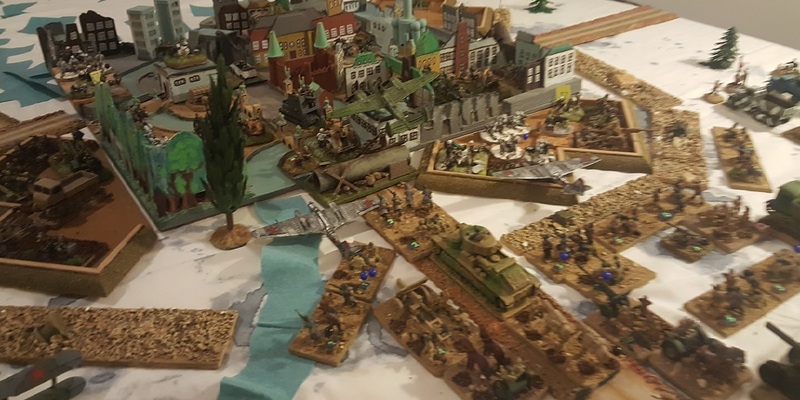 But by this time the game (and real) clock was running it – and the intitial ‘coup de main’ had failed. 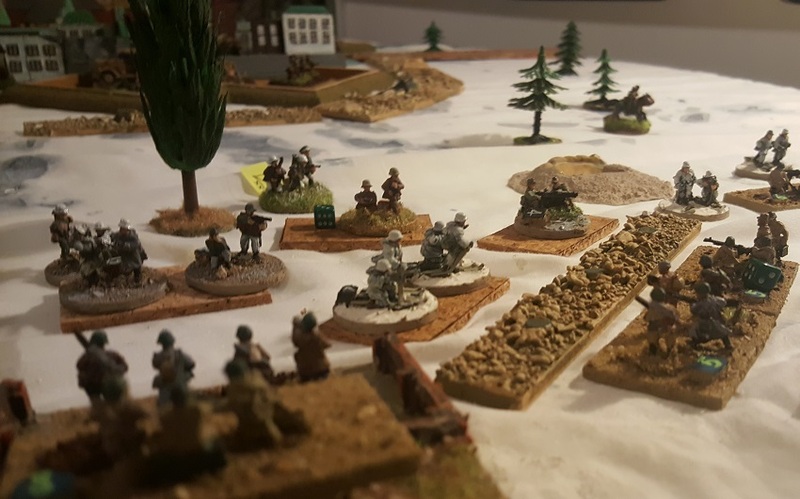 Fortune had allowed the Axis build to be more immediate and, as the picture shows, a strong grip was closing around the French footholds. Many thanks to the players for entertaining me for a coupe of hours – I really enjoyed seeing it play out. 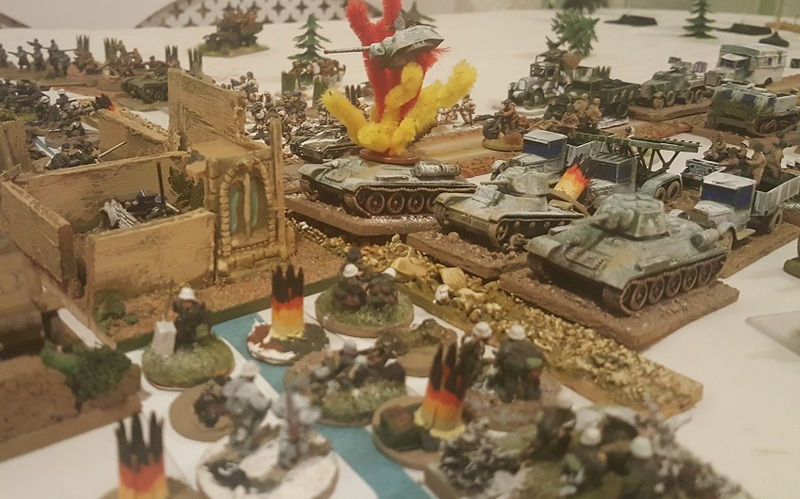 This game still works for me. 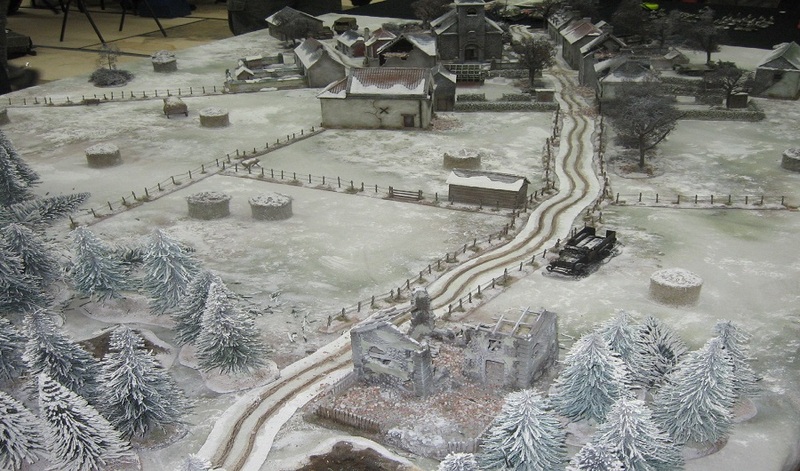 This wintry landscape was a compelling demo of Chain of Command inspired by the Band of Brothers Foy episode. 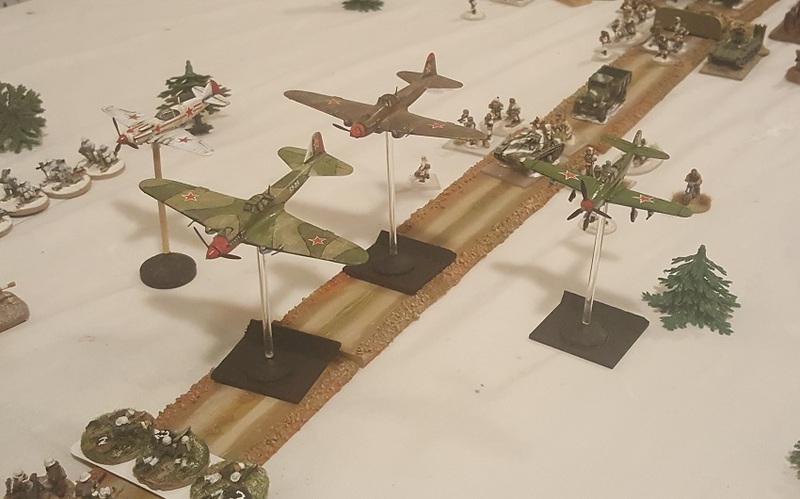 I don’t do 28mm skirmish games but this one was worth the hype. We had a long chat … one of the passers-by had even worked on the original programme (and he was impressed too) – well done everyone! 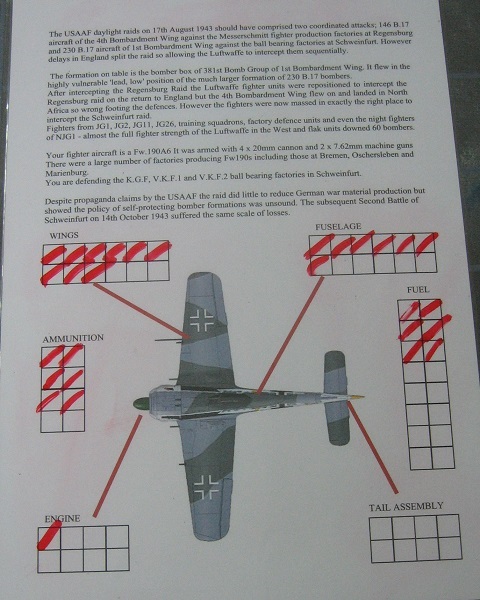 So, some traditional stuff and some good ideas … in all, I enjoyed this German take on the bombing war. 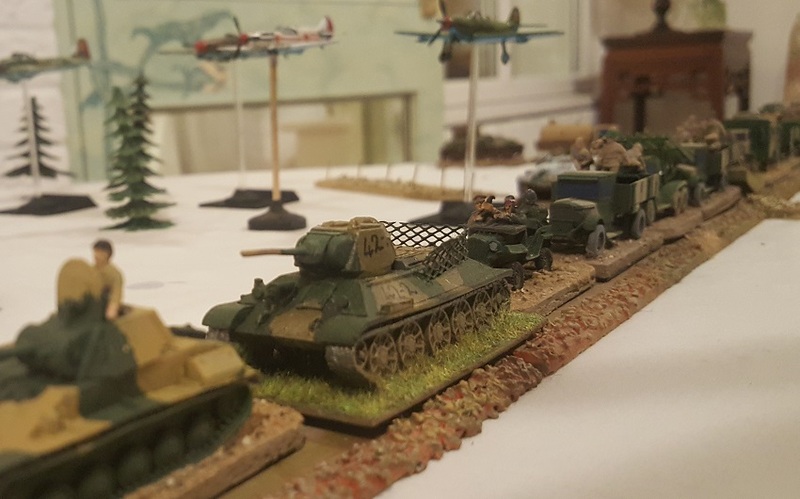 In amongst a bundle of Zvezda boxes, I got a couple of Russian trucks (actually Katyushas, but that’s because I’m adapting them so opted for the extra wheels). … a nice neat front with none of the frustration that used to be part of this package. 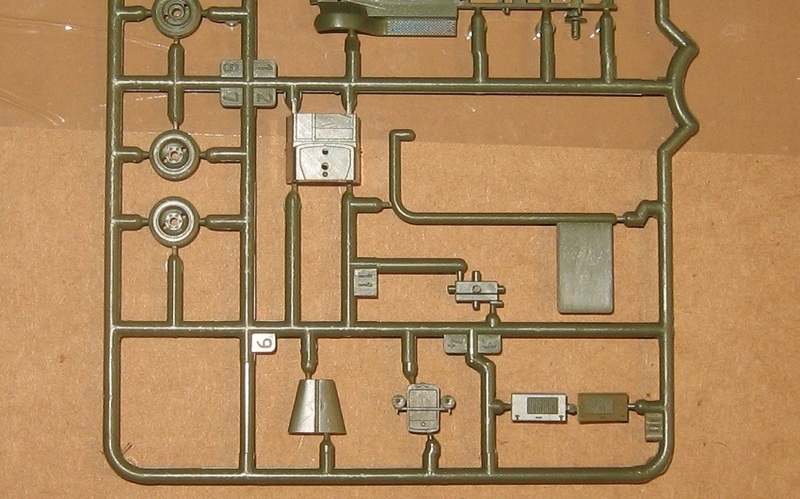 Given the Zis 5 model shares a sprue with Katyusha, I’d assume Zis 5s have got or will get the same improvement. worth sharing I think. I was very pleased with this chance discovery!